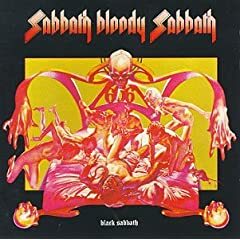 I recently took a real good listen to Black Sabbath's "Sabbath Bloody Sabbath" (1973, 5th studio album) for the first time in 20 years. I had the CD for a brief time back in high school or college, but never got into it. So I sold it. As I read about music, specifically the history of metal, this album keeps coming up. So I recently re-acquired it. - "Who Are You?" uses a distinctive analog pad keyboard sound and mentions "Big Brother" in the lyrics. Van Halen uses almost the same keyboard sound on the instrumental song "1984". Coincidence? Or did Van Halen do an intentional homage? I'm inspired now to seek out more Sabbath (the only other ones I have are Paranoid and Master of Reality... I know... weak). I also had Heaven and Hell for a while and sold that. I need to revisit that. Plus I read good things about the late '80s albums with Tony Martin on vocals.